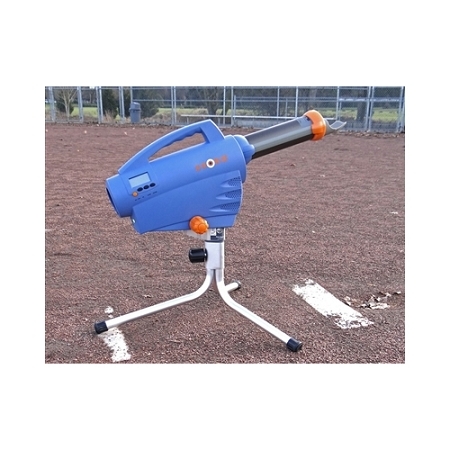 Discount Zooka ZS740 Pitching Machine - Free Shipping! This machine is Out of Stock. It is anticipated to be back in stock in mid-June. 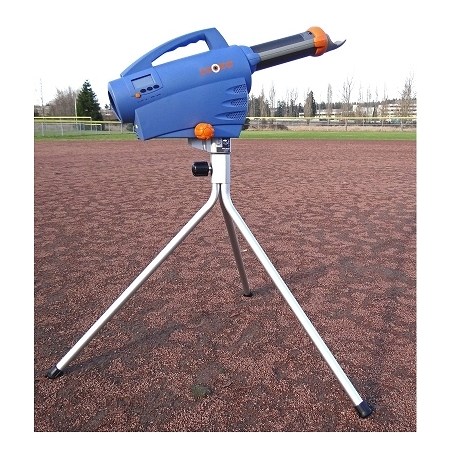 If you asked coaches to dream up the perfect pitching machine, I don't know if they could have come up with anything as outstanding as the Zooka ZS740 pitching machine. At only 25 pounds (less than 30 pounds including the tripod stand) it's so lightweight, you can throw your bat bag over one shoulder, grab the pitching machine with one hand and the stand with the other. One trip from the car to the field. Imagine that? There's no need to deal with the hassle of power cords or gas generators; either, the Zooka ZS740 runs off a 12 volt, internal rechargeable battery that has plenty of juice to get through even the longest of practices. It'll throw 800 balls at 40 MPH, 700 balls at 50 MPH and 500 balls at 70 MPH. Even at its fastest speed, that's 25 cuts at the plate for 20 batters. If that's not enough, grab a backup Zooka external battery - you can attach it to the pitching machine without even having to remove the internal battery and get twice as many pitches in (surely 1,000 to 1,600 throws is enough!). Because it uses compressed air instead of wheels to launch pitches, the Zooka ZS740 can throw regulation baseballs without harming the balls or the machine. Regular baseballs tear up the wheels of ordinary pitching machines, meaning frequent, costly wheel replacements. Keeping the wheels perfectly in balance on an ordinary pitching machine is always a bit of a challenge, too. That's not a problem with a Zooka pitching machine - they're virtually maintenance free! The Zooka ZS740 pitching machine only needs a brief 5-7 second rest between pitches and it's ready to fire another one. 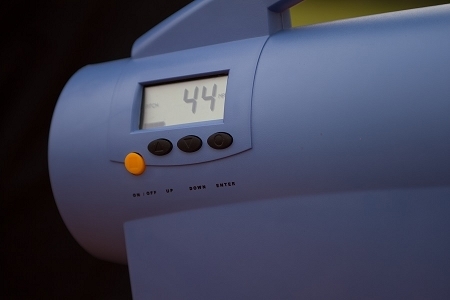 A digital readout on the Zooka ZS740 pitching machine tells you the speed of every pitch and it can be programmed to throw fastballs and changeups at random speeds, too - just like in a real game. Just pre-set up to three speeds and let the Zooka ZS740 keep the batters guessing! Safety features are built into all Zooka pitching machines, too. It automatically shuts down if idle for ten minutes and features a security code so that only responsible adults who know the code can turn the pitching machine on. Zooka pitching machines aren't just for hitters, either. The easy tilt and swivel tripod stand allows you to quickly adjust the machine to throw grounders, fly balls and even major league style 12 story high pop-ups! When you get done with it on the baseball field, toss it in the car, grab your racket and head for the tennis court. Not only can it throw real baseballs, dimple balls and lite balls, but it's a tennis ball machine, too! 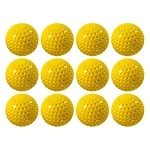 PLEASE NOTE: For the best accuracy, use dimple balls. For realistic game-type pitching, switch to real baseballs and the seams of the ball will cause pitches to scatter all over the strike zone. Although the Zooka ZS740 cannot throw softballs, plenty of softball teams use it for practice. Once you get used to hitting something the size of a baseball, a softball looks HUGE coming at you in a game! The Zooka ZS740 is available with either long legs or short legs. People using it for softball or for really young players especially like the the shorter legged version of the machine. The long legs provide a pitch release height of 43 inches; the short legs have a release height of 24 inches. The Zooka ZS740 is also very well made. It features a thick steel chassis, a high impact polycarbonate housing and a high-strength aluminum alloy barrel and tripod. Zooka is so confident you will love this machine, they offer a 30 day money back guarantee along with a one year warranty. I use this pitching machine constantly because it is so easy to take anywhere. We use it during team practices - great for fly balls. We take it to picnics, parks - anywhere there is enough space to hit a ball. Best baseball training item I've ever bought! Good pitching machine. Even better for fielding drills. Shoots monster major league pop ups. With real baseballs shoots knuckle balls due to the compressed air launch. Overall I like this machine and think it’s worth the money. The convenience factor is big. Push of a button and ready to go. A: Zooka pitching machines only throw baseball (or smaller) sized balls. Plenty of softball players use them to practice. After all, if you can hit a baseball, a softball looks HUGE and becomes much easier to hit after hitting a much smaller sized ball. A: You can throw pretty much any baseball-sized ball with this machine. The brand or type does not natter at all. It can even throw tennis balls and lacrosse balls. I cannot personally speak for the speed of the machine. We have not tested it but I'm sure the manufacturer has; otherwise, they probably wouldn't get away with making the speed statements that they make. And, of course, if you need it to seem like it is throwing even faster than 65 MPH, you can always move it a little closer to the plate. The Zooka ZS740 is also backed by a 1 year manufacturer's warranty. Please read more about Zooka Sports' One Year Warranty here and see our Shipping, Returns & Warranties page for full details. No matter where you order a Zooka ZS740 pitching machine from, NOBODY actually stocks them; they all ship directly from the manufacturer's warehouse located in Redmond, Washington. Therefore, the shipping time frame is exactly the same no matter what website you order from (we hope that it is this one!). Zooka ZS740 pitching machines typically take 2-4 business days to ship from the time you place your order. They ship via FedEx Ground and could take anywhere from a day or two to a week to get to you AFTER being shipped, depending on your proximity to their warehouse. We will notify you of your tracking number the moment we receive it from the manufacturer's warehouse. Click here to download an easy to read, printable PDF of the Zooka ZS740 Owner's Manual.